Did you get a $3/1 Bic disposable razor coupon in your SmartSource insert yesterday? If so, you can use this at Walmart to get the 12-packs of razors priced at $2.68 for free plus overage! I used it today at WW, but got the pink 10 packs of the ladies razors with it, same price. I realize the coupon says *any* but the Walmat near me won’t take it… if the item isn’t pictured, they rarely accept. It’s gotten to be so difficult to use coupons at Walmart (near me) that I’d rather pay a few cents more at other stores! That’s how Dollar Tree is here. They make it such a pain it’s not worth the time. I had the same problem with my Walmart. All I did was smile and continuously point out the coupon states “ANY disposable razor pack” never threw a fit or got angry. Eventually it got to a point they realized I was not budging on the subject and gave me 100% off, but no overage. I was happy to accept it. I used mine at Dillons. They were on sale and I got the overage. FYI. 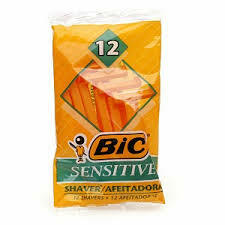 I found BIC Silky Touch razors at Dollar General for $3.00 and by using this coupon, they were free. I didn’t get it in my insert that I got. I’m bummed out. How come?